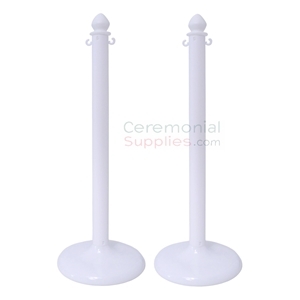 These Economy Weatherproof Plastic Stanchions are sold in sets of 2. Each includes a pole with hollow base, 1 Pole Topper, 6.5' Plastic Link Chain, and a C-Hook to attach chain. Hollow Base allows for easy transportation but may be easily weighed down with sand or water as filler. 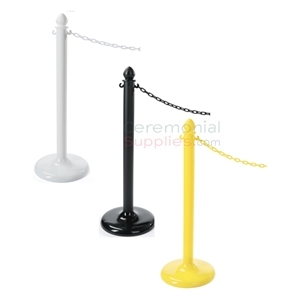 Stanchion poles available in colors Black, White, and Yellow. Plastic is rustproof, waterproof, and fade resistant which makes it perfect for outdoor use but still decorative enough for indoor use as well. It measures 38.3 inches in height and 14 inch diameter at the base. It weighs 15.5 Lbs with filler sand and 1.1 Lbs without Sand. Included chain measures 6.5 Feet in length. Double C-Hooks Allow for multiple line configurations at any event. Made from durable steel and featuring a minimalist matte black finish, these multipurpose stanchions are just the tool for your line management needs. Measuring 41.5 inches in height and having a 14 inch diameter, the stanchions feature a retractable belt that extends up to 6.5 feet, that can be had in 4 colors – Black, Royal Blue, Red, or Grey. They feature a convenient two-part assembly. 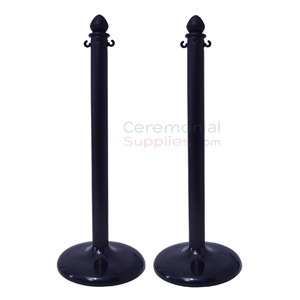 Featuring a steel construction that is extremely durable and topped with a matte black finish, these mini stanchions are a must have for efficient queue management. 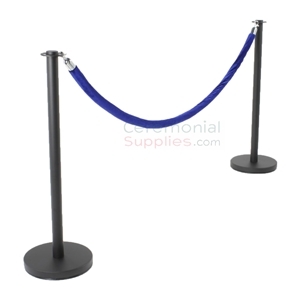 With a height of 24 inches and a diameter of 14 inches, these stanchions come with a retractable belt (available in colors black, red and blue) that can extends up to double that of a regular stanchion at 11 feet to maximize spacial economy. The stanchions are sold individually to meet your exact needs, and feature an easy two part assembly in addition to a 4 way adapter that adjusts any way you require. Mini Stanchion feature a Chrome finish on quality stainless steel. Includes retractable belt extends up to 11 feet. 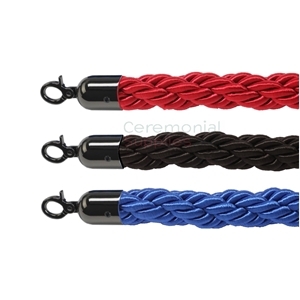 Belt comes in colors Black, Red, and Blue. It also features a four-way adapter top to create any line configuration. Mini stanchion measures 24 inches and 14 inches in base diameter. Requires an easy two-part assembly. Stanchions are sold separately. 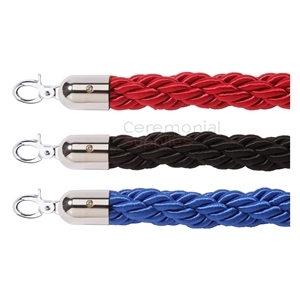 Set includes 2 luxury chrome stanchions with urn shaped top and a red velvet rope line with matching hooks. 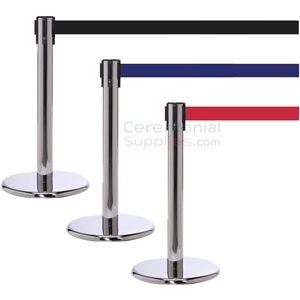 Stanchions are made from stainless steel with a shiny chrome finish. They feature a four-way adapter disk to create any line configuration as needed. Stanchion post measures 39 inches in Height and 12.5 inches in Base Diameter. It is built with a sturdy base and weighs about 17.5 Lbs. Velvet rope is available in colors Red, Black, and Royal Blue and measures 6.5 feet in length. Their latch hooks secure the rope to the queue poles. Easy 2-part screw-in assembly is required. 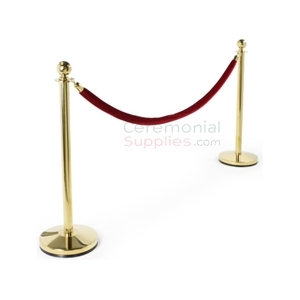 Made from stainless steel and featuring a brassy golden finish, the Luxury Brass Stanchion and Rope Queue Management Set includes a set of 2 luxury brass stanchions and a burgundy velvet rope with matching hooks. Further included is a four-way adapter disk to create any line configuration. The stanchion measurements are 39.5 inches in height, and 12.5 inches in base diameter, with the velvet rope length being 6.5 feet. The sturdy base, weighing 17.5 lbs, keeps the stanchions firmly upright, while the easy 2-part screw-in assembly and latch hooks secure the rope to the poles. Crowd management products are some of the most important tools to maintain order in any event or business with foot traffic. They often go unnoticed but this is the beauty of a well thought out crowd control system. If the right crowd control products are strategically placed at any venue or place of business, your guests or patrons will not require much detailed instruction about where to go and what to do. Most people will recognize the queue management posts, classic ropes, and retractable belts but they do not even know what they are called. Quite frankly, they are probably not interested, but if you don’t have them in place, chaos will arise the moment a rush foot traffic occurs. Stanchions, rope and retractable queue posts are just a way for you to operate your business or function smoothly. In today’s retail climate, crowd control products like stanchions, rope, and retractable belt queue posts are more important than ever; not just because they help you organize your business but for safety reasons. Government agencies at all levels are requiring businesses to have proper crowd control systems in place to ensure the safety of the visiting public as well as the safety of employees. Poor crowd control management can end up in serious injury and even death, and as a result, lawsuits may be filed against the businesses responsible. Yearly, Black Friday doorbuster stampedes end up in serious injury to customers as well as employees due to a lack of proper planning. Every business that deals with the public should have proper safety crowd control equipment to protect both parties along with proper insurance coverage. 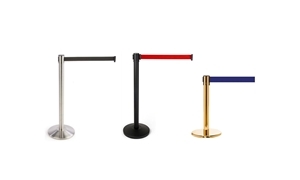 In fact, many business insurers require that proper queue management products like stanchions and barriers are in place in order to provide coverage. The Occupational Safety and Health Administration (OSHA) is one of the major advocates for employee and consumer safety in the retail industry. Their Crowd Management Safety Guidelines call for the use of crowd control products to decrease the risk of accidents by properly guiding clientele—especially during special sales events. The National Retail Federation (NRF) is also concerned with the safety of shoppers and employees, and just like the OSHA, the NRF’s Crowd Management Guidelines encourage the use of stanchions, rope, and other queue solutions. This, of course, spans to other non-retail industries that still deal with a high number of visitors daily, like event venues, banks, amusement parks and hospitality businesses among many others. All events, no matter the size, should be prepared with crowd control products to manage a large number of attendees. However, luxurious events like ceremonies, galas and some theater presentations require as much décor as they do safety precautions. 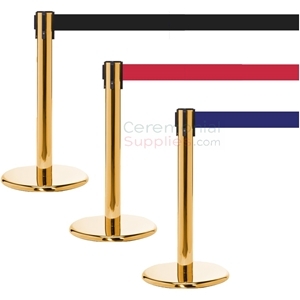 Certain types of stanchions are a better fit for special occasions. 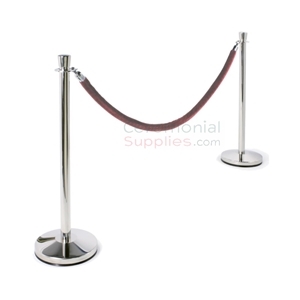 Classic stanchion posts that utilize velvet rope as opposed to retractable bands perform just as well while adding an air of luxury and refinement to your venue. Brass and chromed stanchions are perfect examples since they have a high gloss metallic finish that renders a great appeal but their quality stainless steel construction and heavily weighed base make them just as sturdy and durable as any. Even retractable band stanchions can come in these metallic finishes, so even if you want to skip out on the classic velvet rope, you can still achieve a luxurious look. 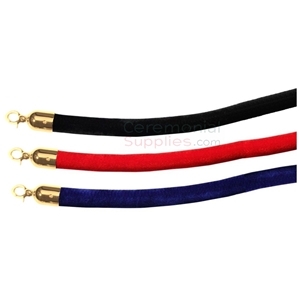 These types of stanchions come with various color options for the bands that can be just as appealing as velvet rope. The only downside to some of these deluxe stanchions is that they sometimes cost more than the non-decorative ones. So, if a luxury stanchion is not within your budget, don’t pass up on safety. 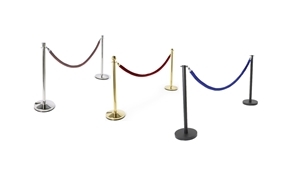 Standard stanchions won’t necessarily be an eye-sore at your event, and your guests will be better served with proper crowd control safety products in place. Regardless of industry, if you expect to have customers or visitors at your place of business, crowd management products like stanchions and rope play a big role in safety. The question is which crowd control products are right for your business? Above, we mentioned the use of luxury stanchions for special events that call for elegance, but there are various types of stanchions that better fit other industries. Retractable band stanchions, for example, are excellent for banks, public parks and retail venues because they provide on-the-go solutions thanks to their “all in one” inclusion of the built-in band to act as a queue barrier. You can easily lock and unlock the belt latches to the head of the next stanchion for quick line configuration. Likewise, the size of the stanchion plays an important role in its use. Mini stanchions are typically about ½ to ¼ of the size of a regular stanchion. 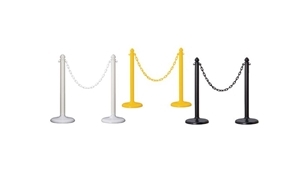 Mini stanchions also come in standard and deluxe metal finishes and with options of rope and retractable band—just like regularly sized queue poles. However, their use is a sort of specialty since they create a crowd control barrier that is excellent for car shows and museum exhibits because they don’t stand out high enough to obstruct the view. Mini stanchions pose less of a threat to the exhibited items because they don’t tip over as easily, and if they do, their fall range is minimal. Other types of stanchions include plastic, which are made from a durable waterproof material that is excellent for outdoor use while being a great economical alternative and safety colored posts that call attention to hazards. 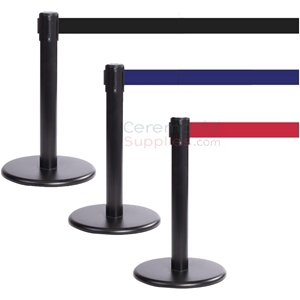 No matter what the use, CeremonialSupplies.com features quality crowd control stanchions and queue management products to help make your business safe and organized. 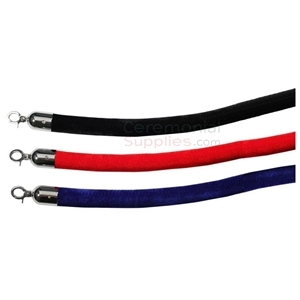 Whether you are searching for stanchions with rope, retractable bands, or stanchion signs, we have you covered with a wide variety of choices in various colors, materials, and finishes. Take a peek at our selection of specialty mini-stanchions for car shows and museum exhibits or our luxury classic stanchions for prestigious events.